Home › Research › Result of the Month › Nonnegative matrix factorization (NMF) with L0-sparseness constraints enforces a part-based representation of data. Nonnegative matrix factorization (NMF) with L0-sparseness constraints enforces a part-based representation of data. 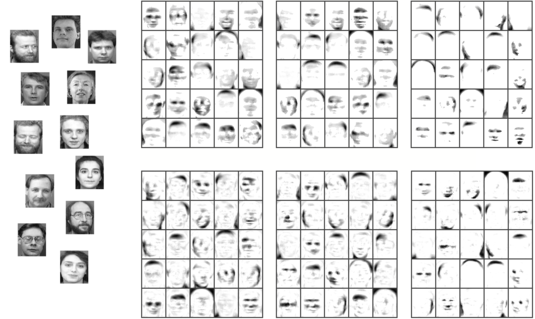 Left: examples from the ORL face images (http://www.cl.cam.ac.uk/research/dtg/attarchive/facedatabase.html). Right, top: bases extracted using L0-sparse NMF with 10, 25, 33% percent non-zeros pixels. Right, bottom: bases extracted using L1-sparse NMF with corresponding sparseness values (Hoyer, 2004). Nonnegative matrix factorization (NMF) is a popular data mining technique, which typically results into a sparse and part-based representation. To further enhance sparseness, several authors proposed NMF techniques which constrain or penalize the L1-norm of the NMF components, which is known to introduce sparsity. Sparseness measured in terms of L0-pseudo-norm (i.e. number of non-zero pixels) is typically considered as hard problem. In this work, simple but effective approximate techniques for NMF with L0-sparseness constraints are proposed. L0-sparse NMF achieves almost the same reconstruction quality (SNR) as L0-sparse NMF, while being significantly sparser in terms of L0-norm. Further information can be found in the publication!